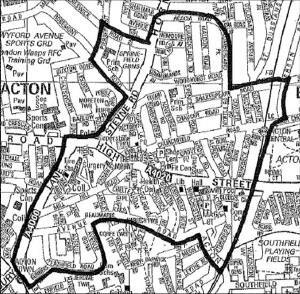 Two new dispersal zones have been created in a bid to cut down anti-social behaviour in Acton. The first is around Acton Town Centre and comes into action on Wednesday 15 May 2013 - it will be reviewed in November. 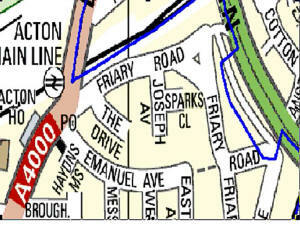 The second is around Friary Road. Tell people in the group to disperse (either immediately or at a stated time and in a stated way). Tell people who don’t live in the affected area to leave (either immediately or at a stated time and in a stated way). Tell people who don’t live in the affected area not to return to the affected area or any part of it for such period (not exceeding 24 hours) from when the direction was given, as he/she may specify. If you are under 16 you may not be allowed to be here between the hours of 9pm and 6am unless you are under the effective control of a parent or responsible person over the age of 18. You may be removed to your home or place of safety if more appropriate. To contravene a direction is an offence under Section 32 of the Anti-social Behaviour Act 2003, punishable by 3 months imprisonment and/or a fine not exceeding £2500. A notice will be displayed in the affected area announcing the end of the authority when it no longer applies. Superintendent Simon Message said: "The introduction of this dispersal zone sends a strong message that anti-social behaviour will not be tolerated. “It will also ensure that the area and surrounding streets remains a safe environment for those residents and members of the public, who live, work and visit their local amenities now and in the future. Any individuals, irrespective of their age, seen to be acting in an anti-social manner will be dealt with appropriately. It is important that people witnessing any anti-social behaviour in the area report it to the police immediately so the appropriate action can be taken against offenders. For further information, contact Acton Central Safer Neighbourhoods Team on 020 8721 2921. In an emergency always dial 999.